Earn $2.37 in Rewards credit (237 points) What's This? 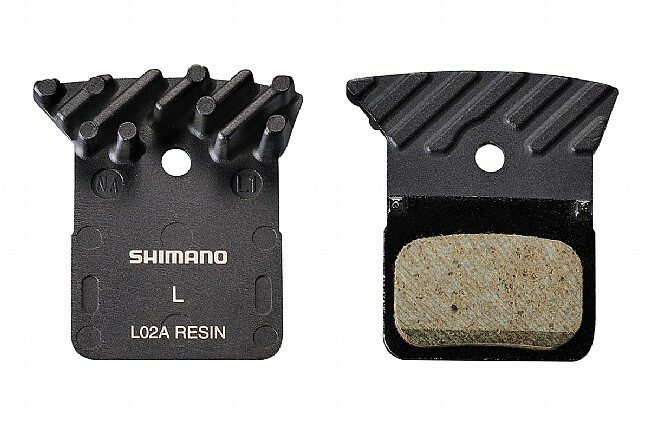 These Shimano L02A Resin Disc Brake Pads are direct replacements for those found in Shimano's BR-RS805 and BR-RS505 road disc brakes. The resin compound is quieter than the L04C metal compound model but supplies less overall braking performance in wet, muddy, or dusty conditions. Integrated cooling fins help shed heat to reduce brake fade under heavy or prolonged braking. Sold as a set for one brake. Buy two sets to complete both front and rear brakes. Use these on the road bike I ride in the rain. Bought them to replace metal pads that squealed like crazy. These are quieter, but they still squeal. I don't know that it's the pad's fault though, I think maybe the rotor Shimano uses for their Ultegra set just might be noisy in the rain. In any case, it is an improvement. Resin or metal for road? Resin is the answer - quiet, smooth, easy to modulate. Shimano quality. Mine last about 4-5,000 km on a pretty tough commute cycle. Great in hot or cold, sun or rain. I use these on 4 different bikes for road, commuting and cyclocross. They are quiet and provide good consistent power. I am still on my original pair of these disc pads. They are very, very easy to remove, inspect, clean andor sand if necessary - perhaps a bit easier to service than rim brake pads due to access. But that is open to debate. Cooling fins are not necessary for flatland use. I cannot comment on effectiveness for long hill or mountain descents. These pads provide excellent stopping power and modulation. Excellent control. Quieter than metal but wear much faster. As long as you can do your own maintenance the cost to wear differential is worth a quite ride.